I typically steer clear of group tours at all costs when traveling, preferring instead to go at my own pace. The “hurry up and wait” of the group dynamic is tiresome, as is spending time in places where I have no interest (e.g. shopping.) I love learning about the history of a place, but not while standing in a circle in the baking sun with other impatient people whispering, shuffling their feet, etc. And then there’s the dreaded tourist buffet for lunch, which reminds me of dorm food. No, best to go it alone. But sometimes, logistics make it just too challenging. Such was the case in Oaxaca. I could have negotiated a taxi to the places I wanted to visit, but for a mere $11, I could have an all day tour with an English-speaking guide. Just write my name on the form and hand over 220 Pesos without ever having to utter a word, for I have contracted a dreadful case of laryngitis, and can barely eek out a whisper. 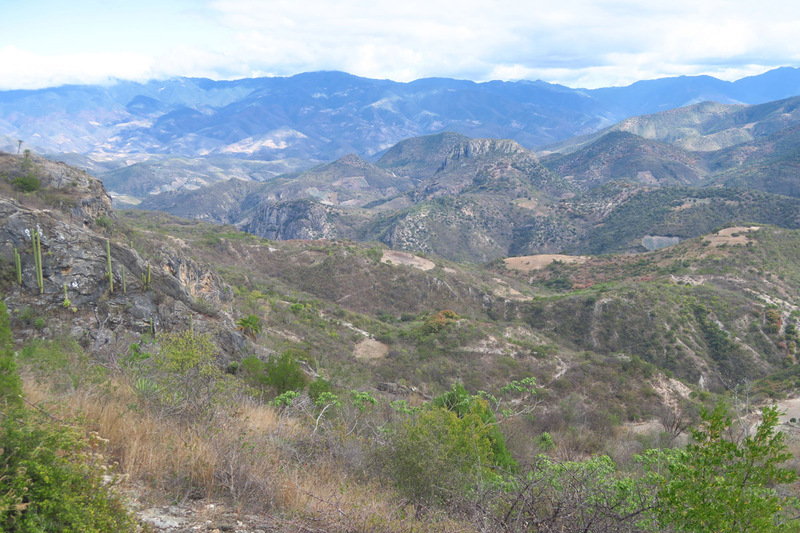 I’ve been to Oaxaca twice before, first in 2012 and again in 2014. 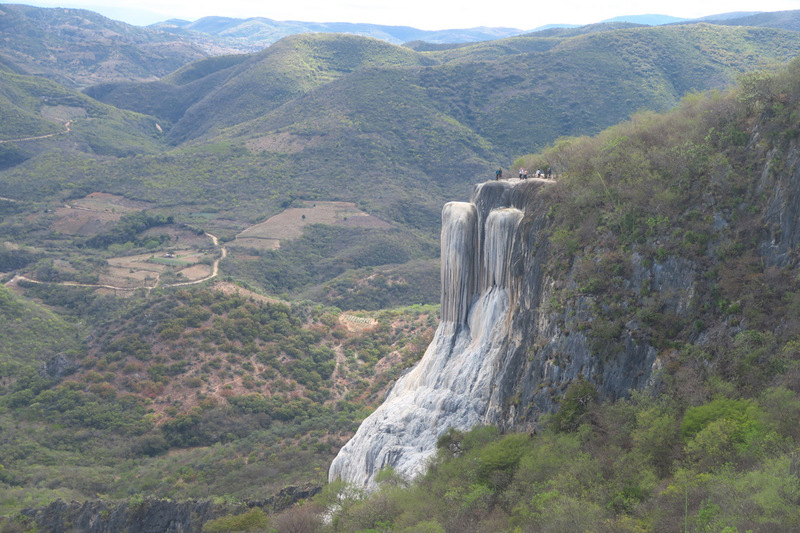 On both visits, I wanted desperately to visit Hierve de Agua, a “frozen waterfall” made from mineral deposits. But it’s a long way up into the mountains, and not easily accessed without a car. 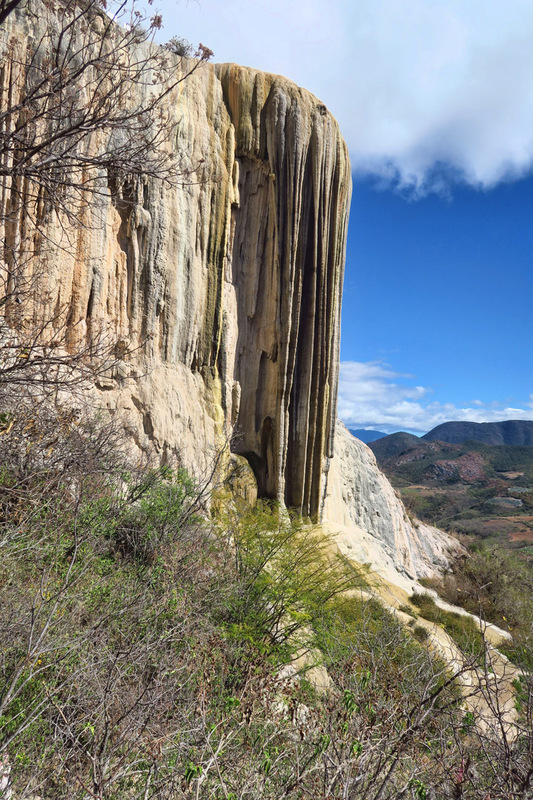 Andador Tours offered this destination as a part of their day tour out of Oaxaca. I figured I could endure the carpet shopping and mescal tasting as a means to an end. I was pleasantly surprised to learn we would be touring in a brand new Sprinter van. I snagged the single-seat side with a panoramic window perfect for seeing new territory. 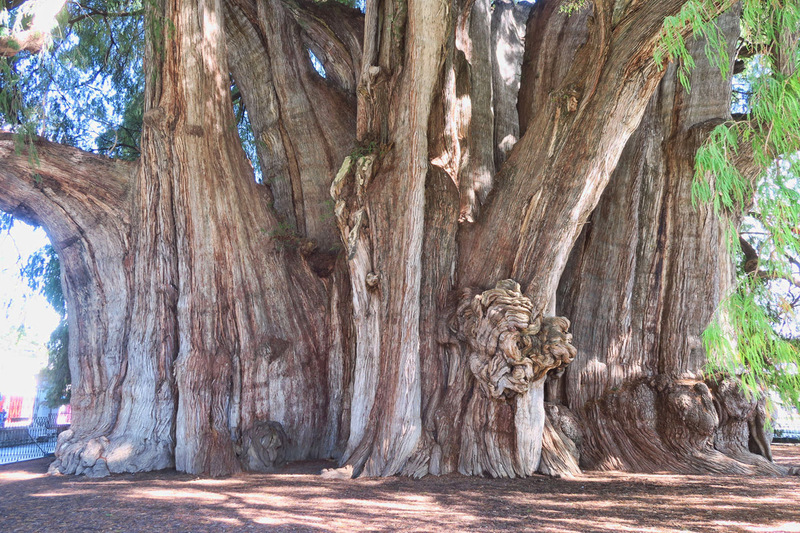 We would be making five stops on the day tour, the first of which was El Tule, location of Mexico’s most famous tree. 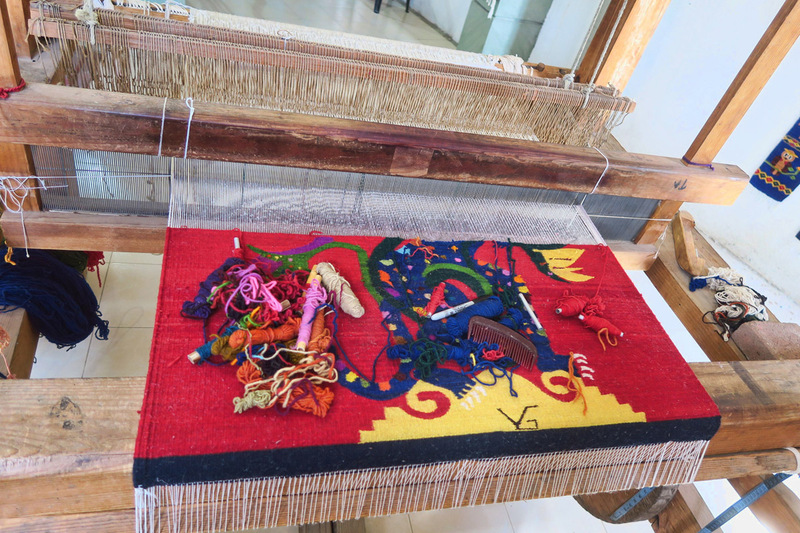 Next we would visit a weaving shop (not as painful as it sounds,) followed by the archeological ruins of Mitla. 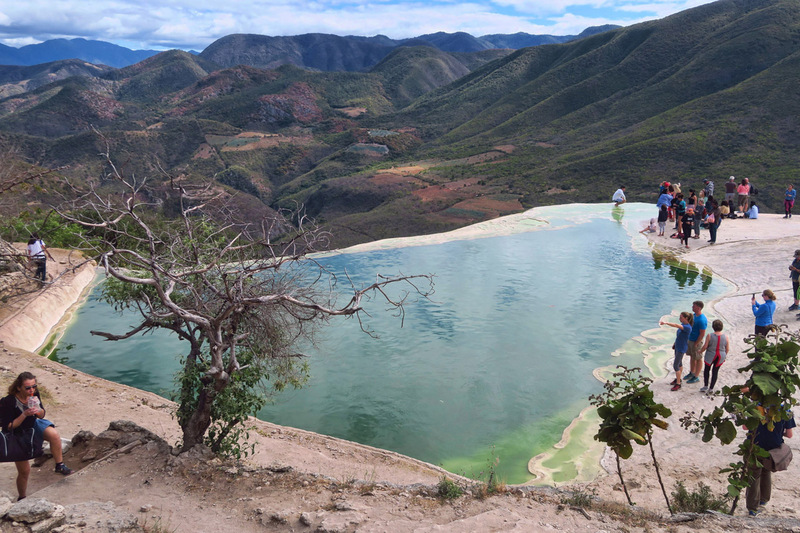 Finally, the part I had been eagerly anticipating and the reason for my succumbing to a group tour, Hierve el Agua, reached by a drive up into the mountains near Mexico’s Continental Divide. We are near the narrowest part of Mexico, the isthmus before the continent fans back out toward the Yucatan and Guatemala. At this narrowest point, it’s only 134 miles across from the Pacific to the Atlantic Oceans. Not only does Eloy, our guide, speak perfect English, he enunciates his Spanish enough that I can actually understand about half of what he is saying. He has a lot of pride and passion for his home state of Oaxaca. He tells us Oaxaca State is #4 In production of oil within Mexico, #3 in production of cement in North America (I find this interesting since I grew up in “The Cement Capitol of the World.) #2 In production of power in Mexico (wind, as the narrow part of Mexico is the windiest part) #1 in the entire world’s production of pineapples, and #2 in production of beer. He gives just enough history at each stop to keep me from getting bored, and runs a tight ship, barking at the stragglers to keep us on schedule. I could not have not received a better bargain for my $11. 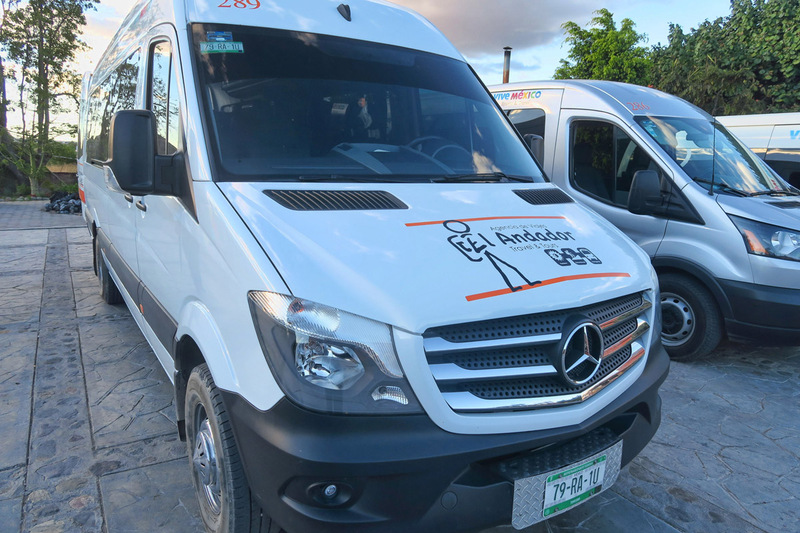 Andalan Tours beautiful new Sprinter van was very comfortable for touring. You can tell how huge it is by comparing it to the four story church spires. The tree is so large, I can’t begin to capture it in a photo. Second stop was the wool rug artisans where wools are died and carpets made. 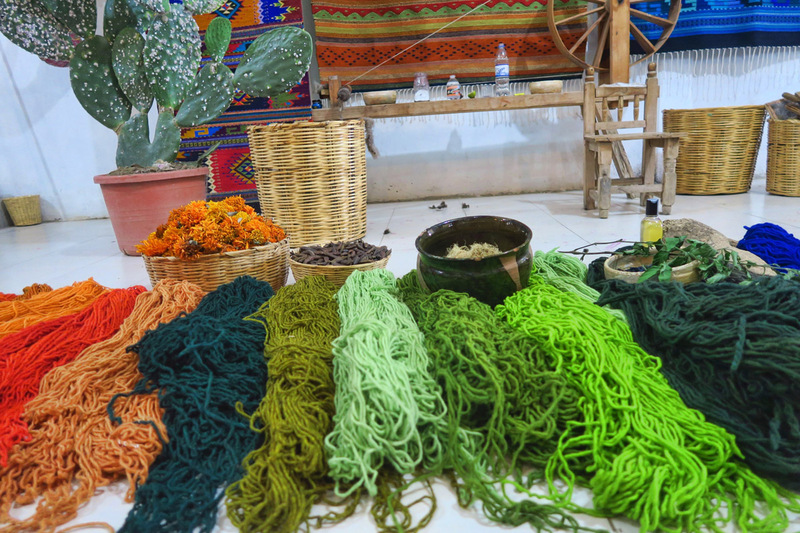 Oaxaca is known for their use of natural dyes. I first became aware of the toxicity of pigment while attending the Plein Air Invitational at Zion. 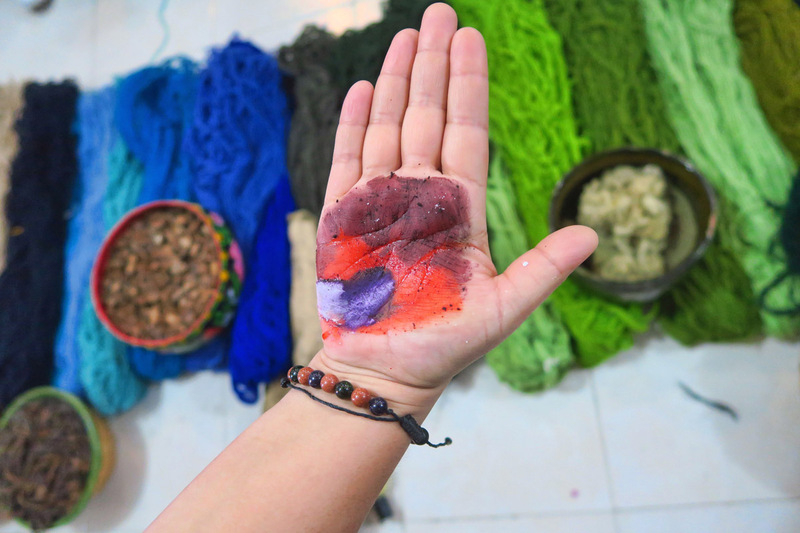 Artists talked about protecting themselves from the chemicals in pigment by wearing rubber finger cots and masks, while others are making the choice to sacrifice intensity for more natural pigments. Natural colors come from marigolds for the golds and yellows, wild moss for the greens, and indigo for the blues. But most indigenous to this region is the cochineal, a scale-like insect, a parasite which lives on cactus plants. It’s white on the surface because of the scale, but when you scrape that off and grind up the body, it’s color is such a brilliant red that it is used in carmine dye. On the palm of the volunteer in the photo below, you will see the deep rust color which is the original color of the ground insect. Our guide adds lime juice to lower the PH, which makes the bright orange color, then adds lime (from limestone, not the fruit) to raise the PH, making the deep purple color. M&M’s are made in Oaxaca using famous Oaxacan chocolate and natural food dyes, as are many cosmetics. 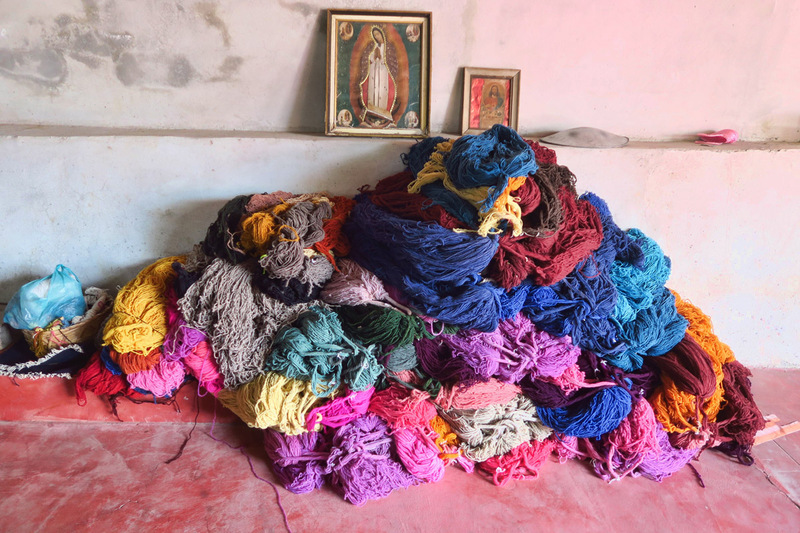 There are over 2,000 looms in Teotitlán del Valle with 75% of the population being involved in some aspect of weaving. Oaxacan-style throw rugs are similar in style to those used in southwestern decor in the US. All these colors are from natural dyes. 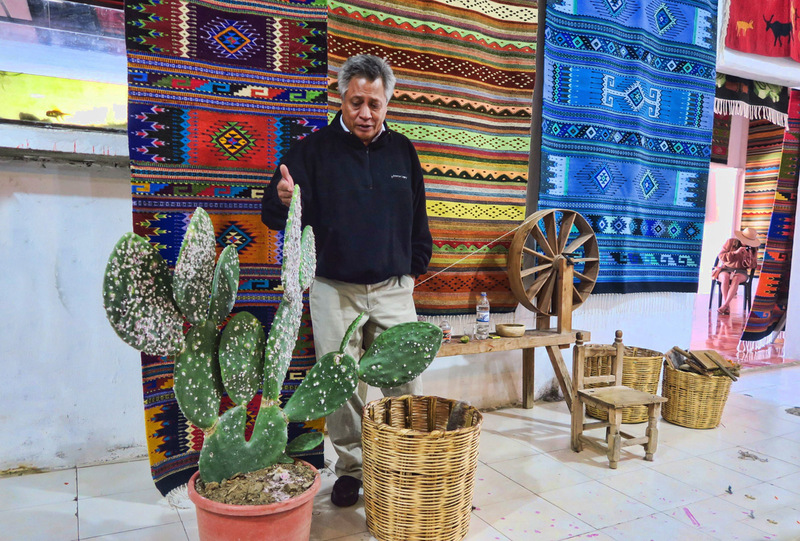 Eloy, our guide, tells us about the cochineal insect, the white dots you see on the cactus. Here, the volunteer demonstrates what happens when acid and alkaline are added to the carmine color made from ground insects. One of the many looms in action. The state of Oaxaca has two important archeological sites, the first of which is Monte Alban, which was more of a political site, while the second, Mitla, was more of a religious site. 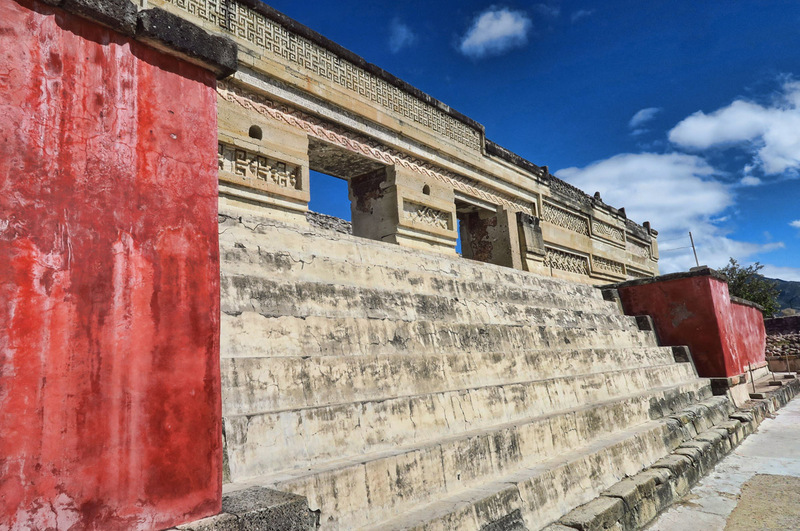 When I was visiting Oaxaca City before, I only had time for one tour, so I chose Monte Alban, the larger of the two. 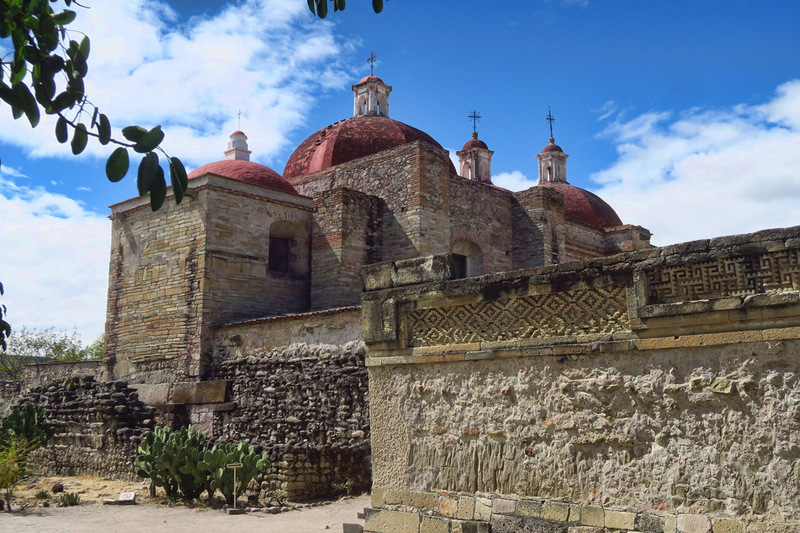 While I was a little underwhelmed by Monte Alban, I had the opposite reaction to Mitla. Maybe it was because of the smaller, more intimate chambers and courtyards. Or maybe because Eloy, our guide told us it was authentic, while Monte Alban contained more restoration. 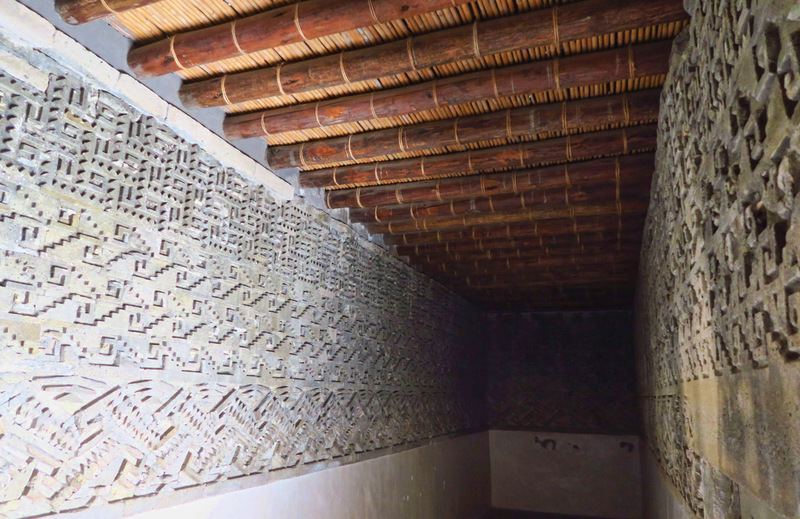 Regardless, I was fascinated by the intricate mosaic fretwork made from small chiseled stone and fitted together like a game of Jenga using no mortar. 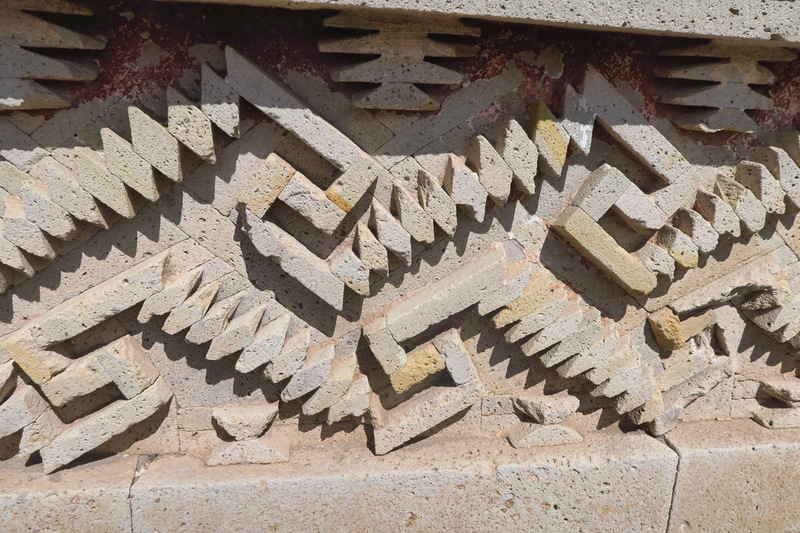 According to our guide, the likes of these geometric works in stone can be found nowhere else in Mexico. 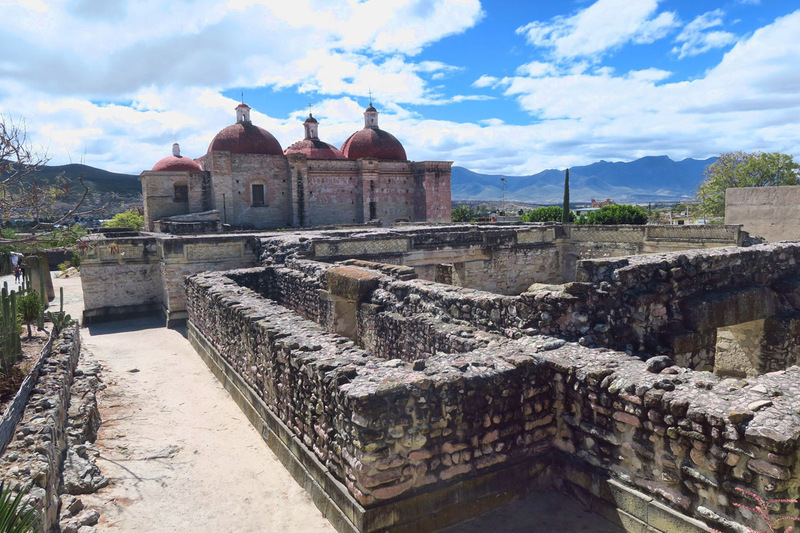 The city of Mitla was believed to be at its peak around 450 to 700 CE, and met its end at the hand of the Spaniards in the 1500’s. 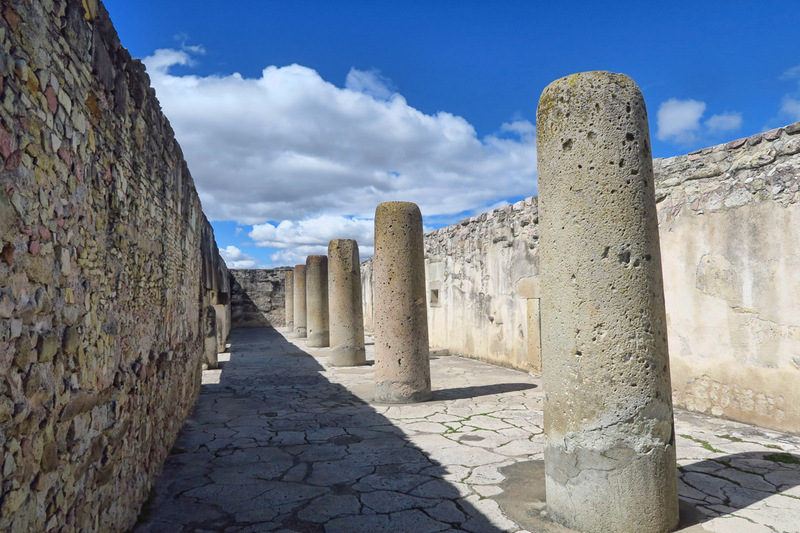 The Templo de San Pablo Apostol is located within the archaeological site of Mitla, constructed around 1590. The church is adjacent to the archeological site. Entrance to the courtyard where the best examples of the fretwork are found. The mosaic fretwork lines the walls. Our guide tells us it is all authentic except the roof, obviously. In order to reach the furthest destination on the tour, we drive up into the mountains. Eloy points out the mountain range which makes up Mexico’s Continental divide where the water flows into the Atlantic and Pacific oceans. At this point, the narrowest point of Mexico, it’s only 134 miles between the two oceans. It’s a beautiful drive to Hierve el Aqua. 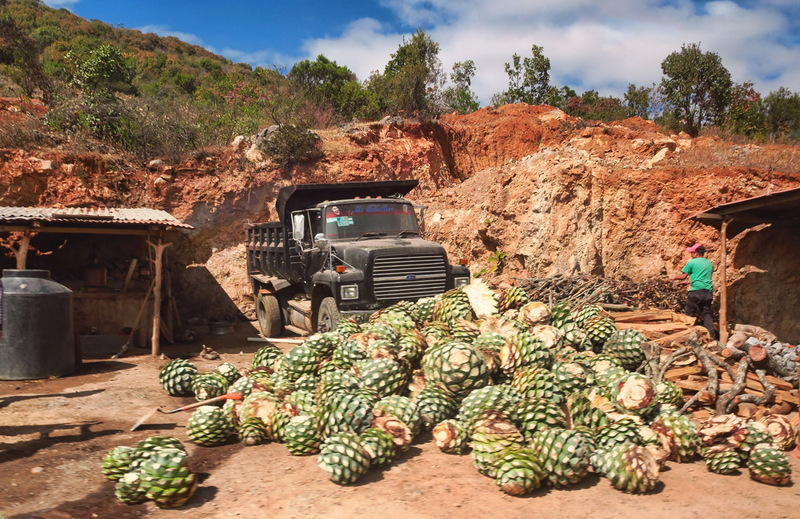 The “pineapples” of the agave plant after harvesting, and about to be loaded for transport to the distillery. 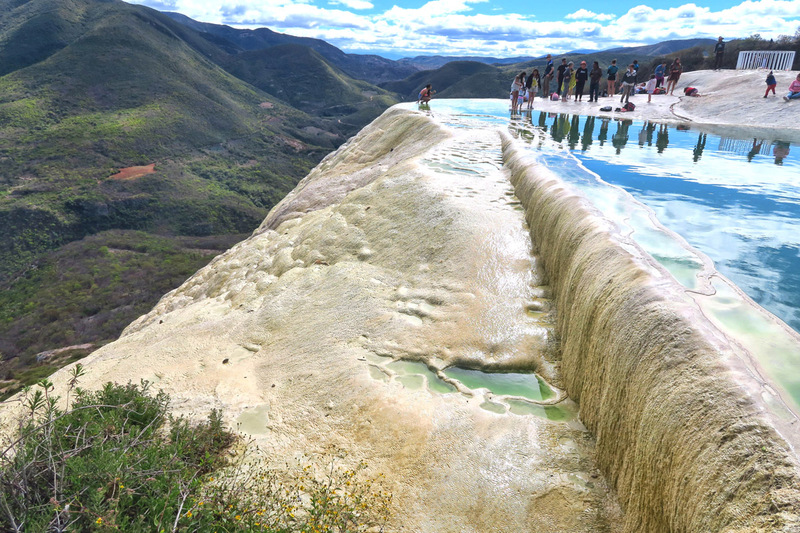 This site was the primary draw for my taking the tour, as there is only one other place in the world that such a phenomena exists, Pamukkale in Turkey. 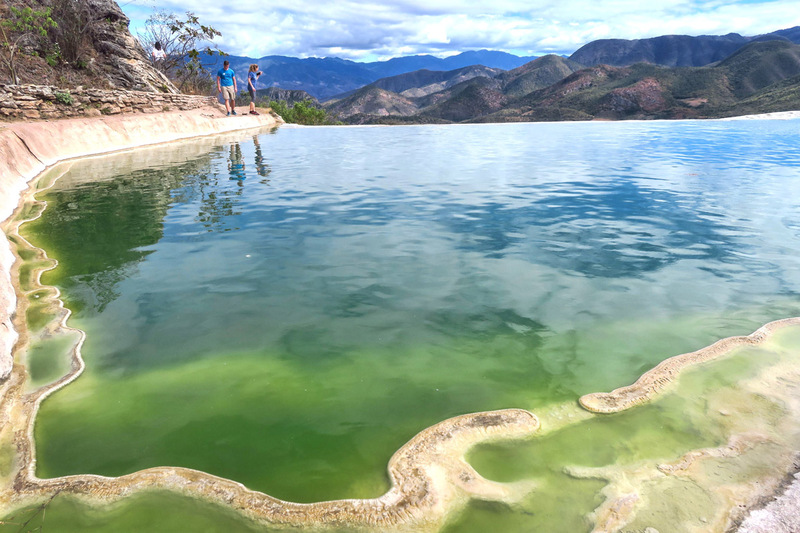 The name Hierve el Aqua is a misnomer, as it translates to “the water that boils.” However, the water coming from the natural spring is cold, and the “boiling” is caused from bubbling up from the spring. 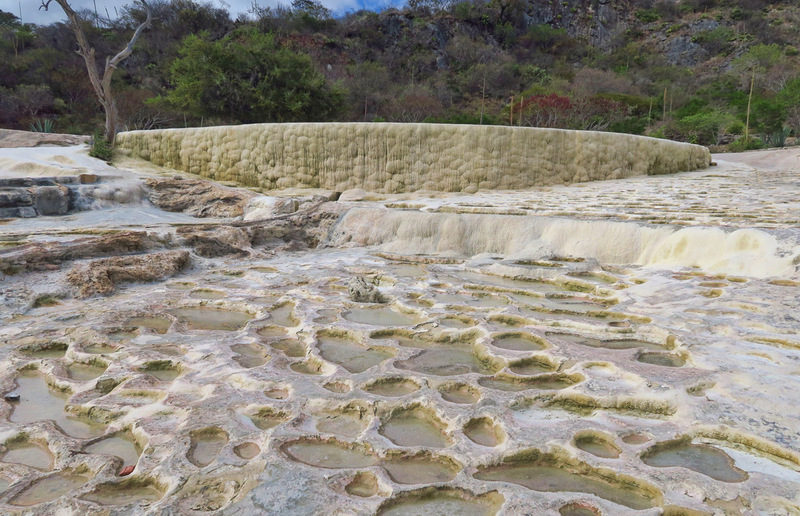 The water is so heavy with calcium carbonate that it has formed white stone cascades that resemble a frozen waterfall. 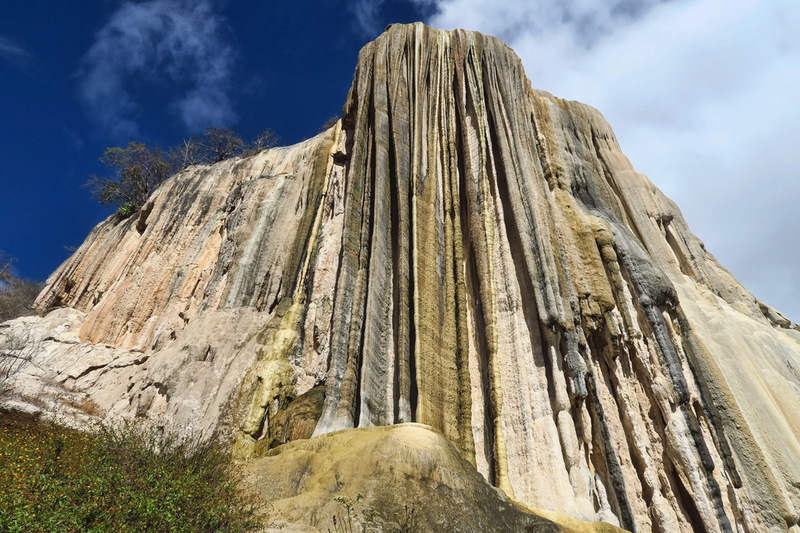 There are two areas, “cascada chica” also known as the amphitheater with pools for swimming, and “cascada grande” which more resembles a giant waterfall. Our guide allocated two hours here, and I wondered how I would pass the time, particularly since it was too cool for swimming. However, I discovered some interesting yet challenging trails down to the bottom of the falls which were worthy of the time allocated. The area known as the amphitheater contains several shallow pools for swimming, though it’s a bit too cool at this time of the year. 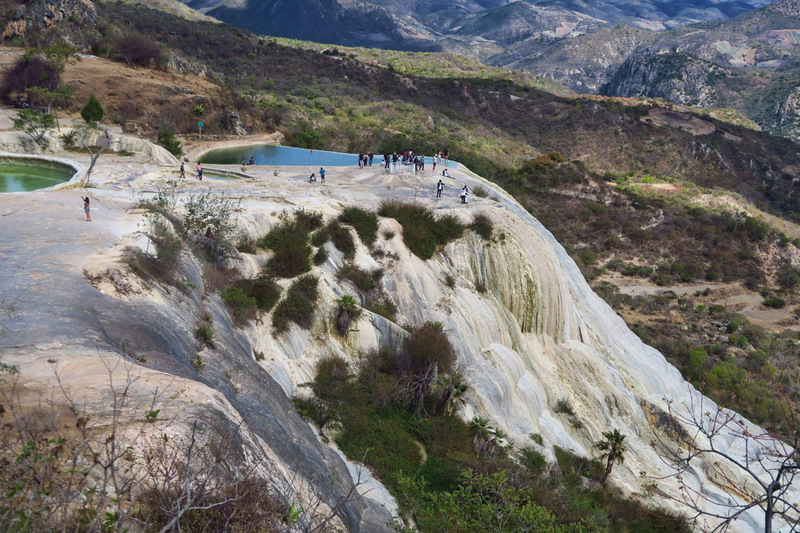 It’s like a giant infinity pool. From the smaller of the two cascades, you can see the larger one which looks like a frozen waterfall. Think of the Instagram likes! Some get a little too close to the edge for my comfort. Difficult climbing out in the afternoon sun, but worth it. 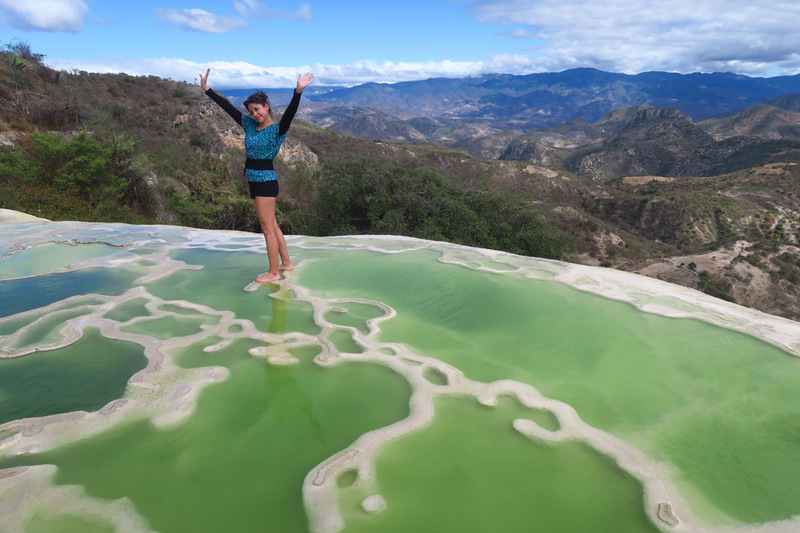 Lastly, what group tour through Mexico is worth its salt (and lime!) without either a tequila or mezcal tasting? 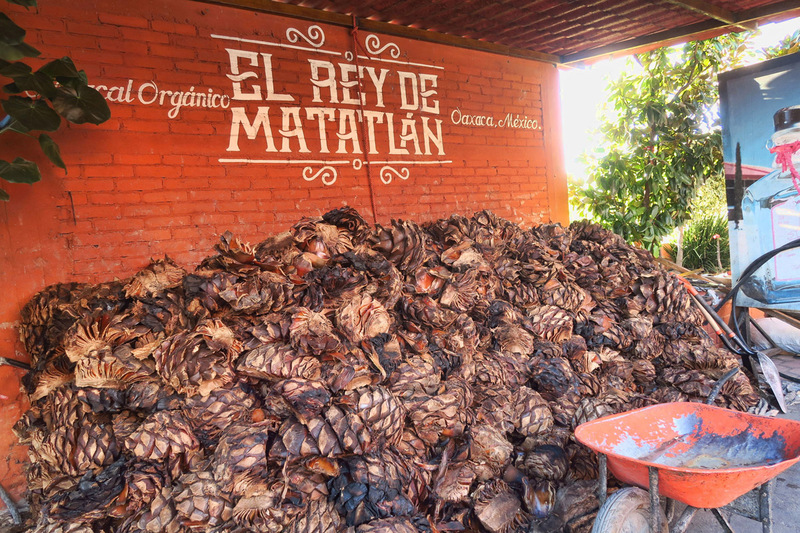 In this case, our last stop is El Rey del Matatlan. 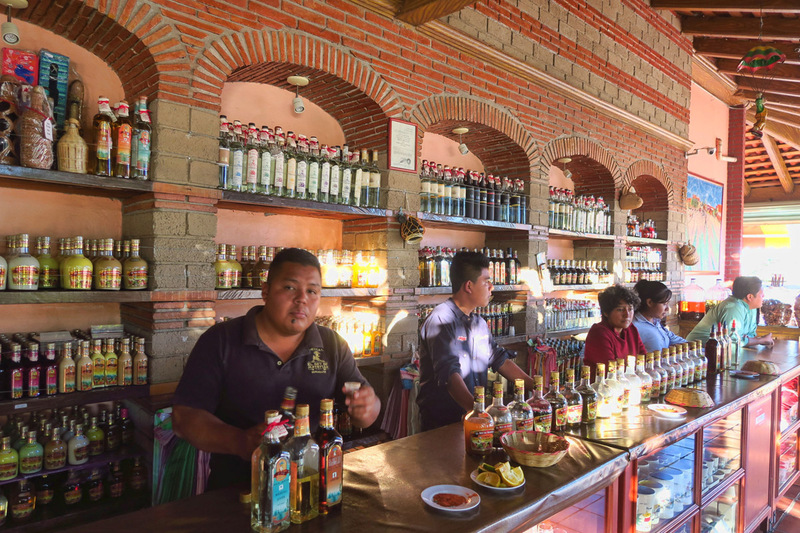 Mezcal and tequila both come from the agave plant, but different varieties. But the processing is what provides the key difference. 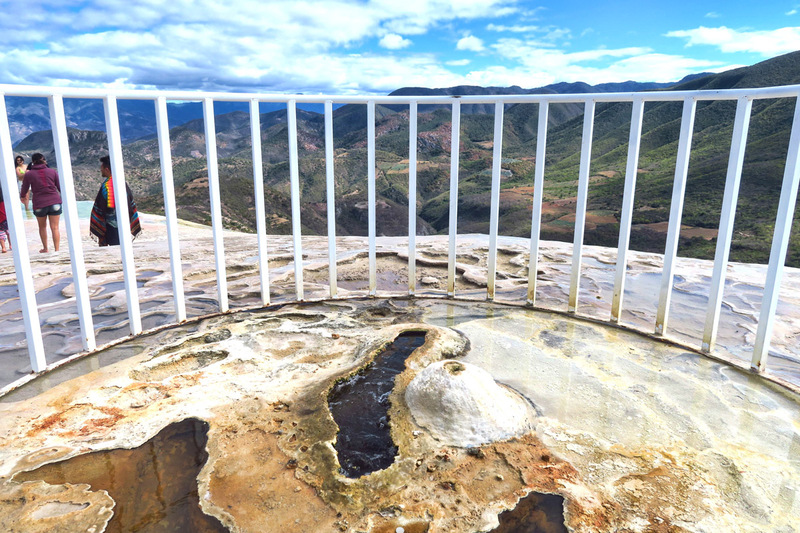 After the agave plants are stripped of their leaves, they are thrown into a giant underground pit with charcoal and lava rocks where they are smoked. 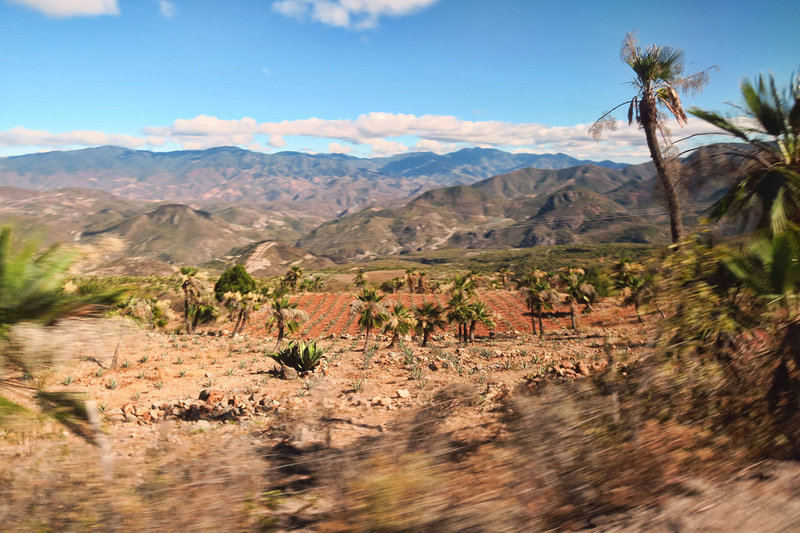 This is what gives mezcal its smoky flavor, distinguishing it from tequila. The “pineapples” have been smoked, and now ready for the fermentation vats. Even with the Mezcal samples aside, I’d say the day was quite a bargain for eleven bucks! 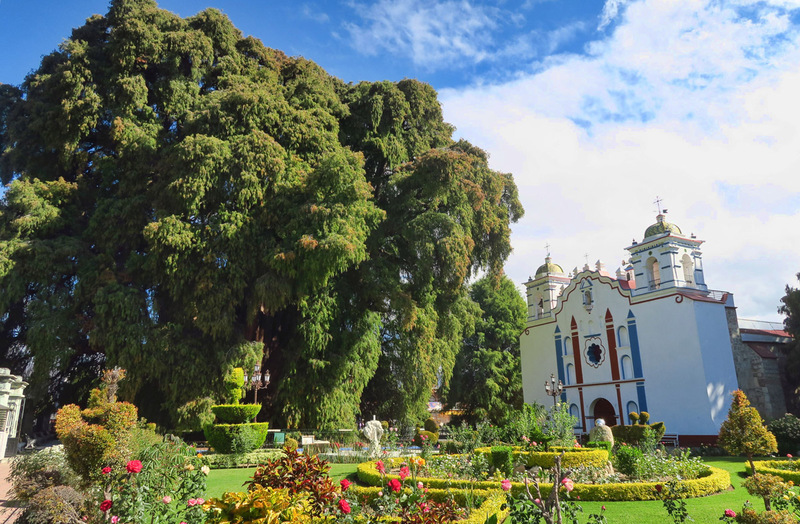 This entry was posted in Oaxaca and tagged Arbol del Tule, El Rey de Matatlan Mezcal Distillery, Hierve el Agua, Mitla Archeological Site, Pueblo Magico, Teotitlán del Valle by Suzanne. Bookmark the permalink. Wow! what a great day you had! Your stories and photos are wonderful, learned so much too. What an amazing place! Thank you, but now I want to go! Thank you for sharing the beauty as only you can do. That sure looks like a fun day even if it was on a group tour. Paige and I did a very similar tour the first time we were in Oaxaca 10 years ago . Without a car, it’s definitely the way to go and usually a good way to meet some nice people. Thanks for reminding me of all the fun we had there! All of these adventures in one day for eleven bucks! Looks like it was worth it to me. That tree is incredible! Another fascinating area in a wonderful country, thanks. Terrific post yet again. The falls are extremely awesome. I did a similar tour from Oaxaca roughly 30 years ago. 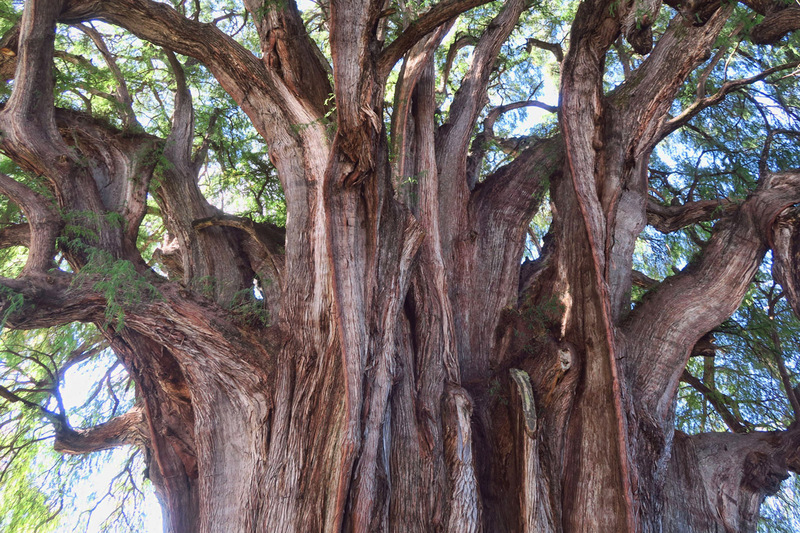 The Tule tree and Mitla were included, as well as a village where we were warned of pickpocket children. Sure enough a group of very noisy and happy looking kids milled around me, but my pockets were pre-emptied. It was enjoyable to let someone knowledgeable do the driving and guiding. So… did you buy a rug??? Lol! Nancy, I ended up having to buy an entire room full of furniture to go around the last rug I bought at the carpet shop in Turkey, so I figured I’d better pass this time around. haha! What?!?! Say it isn’t so, a tour group?!? Looks like it was well worth the money and being with a group. That huge tree is really fascinating. I know whatcha mean about tour groups; some can be a beating while others are not-to-be-missed. Unfortunately, you never know which you’ll get when you’re stepping up into that bus. 🙂 Glad this was a good one. What an interesting state! The “waterfall” is uber-cool. I knew about the Cochineal insects from a bird walk I went on years ago at Cedar Ridge Preserve (south Dallas) ; we had a great field trip leader that spotted them on a cactus and demonstrated the bright red color they exude. And that tree! You shoulda leaned up next to the trunk for scale. 😉 Super post, cuz! Actually, really easy to get to without a car! 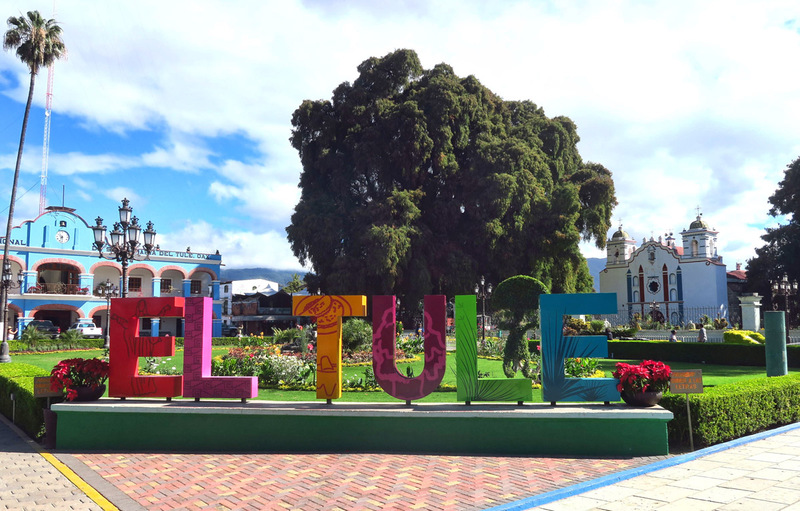 A collectivo to Mitla, and then another collectivo to Hierve el Agua. Probably would have got you there and back for about 75 pesos. Still, for the price you paid for the tour, you did not bad. –hahaha…he “runs a tight ship, barking at the stragglers to keep us on schedule”. I see an imaginary bullwhip snappping through the haze of mescal.